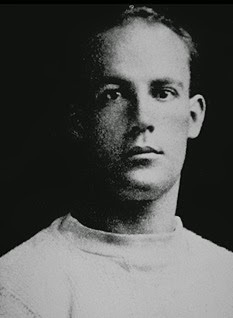 Boynton earned the nickname “The Purple Streak” at Williams College, where he was part of an undefeated (7-0-1) team and a consensus All-American as a freshman before entering the military during World War I. He returned to college in 1919 and was captain of the football team in addition to playing baseball and basketball. Boynton scored 141 points as a senior in 1920 on 22 touchdowns and 9 extra points to lead the nation, including a six-TD game against Trinity College. He was a Walter Camp All-American selection. Following college, he was recruited to play pro football for Rochester and, after appearing in three games, signed on with Washington later in the season. Jeffersons went 2-3 to finish tenth in the APFA. Senators went 1-2 to finish twelfth in the APFA. Boynton played in only one game for Rochester in 1922, concentrating more on baseball. He returned to the NFL with the Buffalo Bisons in 1924 and again performed with distinction, scoring 59 points and receiving first-team All-NFL honors from Collyer’s Eye and the Green Bay Press-Gazette. It was his final season as a player, although Boynton went on to become a football referee for many years in his native Texas, most notably officiating in the first Cotton Bowl game. Overall, in a short but productive playing career, Boynton appeared in a total of 16 games and scored 91 points on 9 touchdowns, 22 extra points, and five field goals.